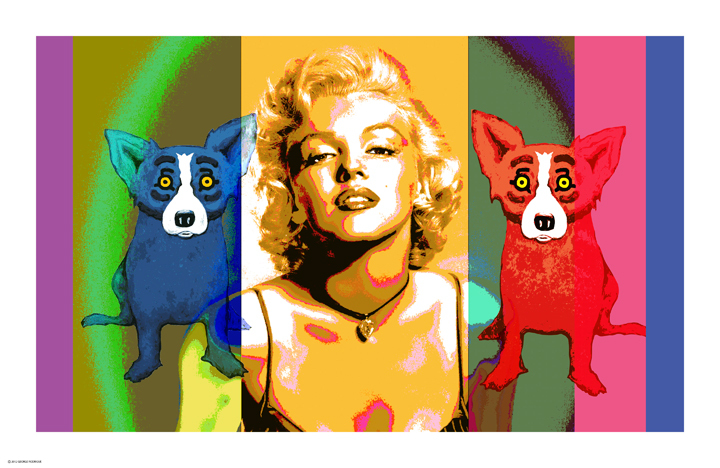 George Rodrigue’s newest artwork, Some Like It Hot, pays tribute to Marilyn Monroe, a golden icon of the silver screen and public fantasy. He frames her with a bold design of color and shape, including his own icons, the Blue and Red Dogs. Countless artists capture Marilyn in their own interpretations, made most famous in art by Andy Warhol and Roy Lichtenstein and photographers Ben Stern and Douglas Kirkland. For Rodrigue, who grew out of the Pop Art movement, the pairing with his Blue Dog is a natural. 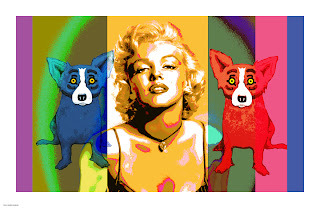 Marilyn is one of the few subjects strong enough to hold its own against his invented image, joining its Red Dog counterpart in a design-battle with the screen goddess. “We think we know movie stars as people,", explains Rodrigue, "but in real life they are someone else. The camera loves their look, and as a result we as an audience interpret what they think. We are seduced by their character. “The Blue Dog is similar. You may look at it and think one thing, but deep down there’s always a mystery of why and what it is. As with many Marilyn fans, Rodrigue's fascination with her look and presence is enduring. In 2004, on his 60th birthday, he insisted that his guests attend as Marilyn Monroe or Elvis “The King” Presley. The party was a literal and visual blast as a sea of bobbing Elvis wigs mixed with platinum ‘dos on the dance floor. A special fan within a small wooden stage blew dresses high over heads, and I mimicked “Happy Birthday, Mr. President” in my best breathy delivery. My mother, Mignon, had a definite Marilyn thing about her. Even now her Marilyn Monroe dress, 1960, hangs in my closet and occasionally on my person, transporting me like magic into a slice of that sparkle, something I like to think exists to some extent within every woman…. as well as the occasional daring and beautiful man. I recall as a child turning carefully the fragile pages of my mom’s Marilyn Monroe scrapbook. During the 1950s she collected hundreds of photographs from LIFE Magazine, along with movie advertisements and snippets from gossip columns. She noted Monroe’s clothing, travels, and dinner companions. This obsession rubbed off on my sister and me, not as crazed Monroe fans, but rather as devotees in our mother’s honor. 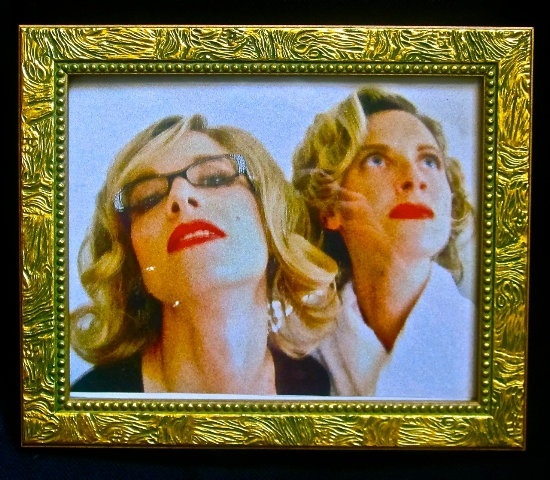 Upon her death, we searched frantically, without success, for the scrapbook. For George Rodrigue, Marilyn Monroe is the first of a series of classic celebrity images, as he works even now on designs incorporating Humphrey Bogart and James Dean. However, these fine art silkscreens, although stunning, are not his ultimate goal. Rather, within weeks his 6-foot unique versions on chrome, similar to his series Swamp Dogs, will appear on the gallery walls. Imagine it.... Not since Warhol, “so much Marilyn…. *” and Blue Dog… on metal! I can’t wait! 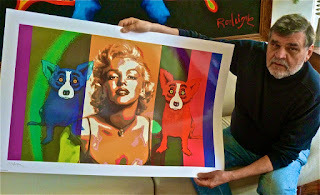 -a note from George Rodrigue: "Sensitive to copyright issues, I looked carefully with my attorney into the use of old Hollywood images. To my surprise, many movie studios in the late 1950s and early 1960s did not copyright their promotional images for films. They were meant to be distributed widely as a way of increasing the celebrity's fame." Hope you can click on this. It speaks for itself! Love the birthday picture of the "Marilyns and the King of Rock", as designated by the necklace!